Compared to the two prior novels in this series, Career of Evil includes some pretty intense and graphic violence, almost entirely against women and children – sexual violence and it’s by serial psychopathic personalities and pedophiles. NOT my favorite kind of crime novel. That said, I actually finished it (stayed up very late finishing it!) because … well … I do so love Cormoran Strike and his assistant Robin Ellacott. 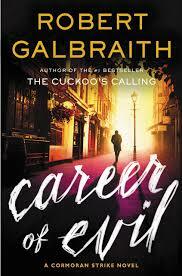 And Rowling/Galbraith is a very good writer. Had it not been for those that combination I would’ve scratched this one quick. But the way Cormoran and Robin met and solved the mystery of the super-model’s death in the first novel, The Cuckoo’s Calling, enchanted me. And then the pair went on to solve the literary mystery of The Silkworm – that was an A+. But hitting the Blue Öyster Cult and Career of Evil (that’s a YouTube link) along with some really ugly memories of men Strike knew from the war in Afghanistan means a fair amount of seriously deviant behavior. Anyway, Strike and Robin are at it again. This time a package, addressed to Robin and containing the leg of a human woman, shows up at the office. Strike thinks through who would want to send this gift, apparently intended for him, and it seems he has at least three possibilities. The first suspect is someone named Whitaker, a wanna-be band member who killed Strike’s mother and got away with it. Then there’s a gangster named Bigger for a second possible perpetrator, but he’s probably too professional to pull these sorts of crimes. A guy named Lang is Strike’s old acquaintance from Afghanistan although he seems a less likely candidate due to arthritis while another man, Nile Broadbank, seems like a serious possibility. The horror is that these guys, Whitaker, Lang and Broadbank – are alive and free, have some serious personality issues and hate Strike for their own reasons. So the narrative moves along between Strike and Robin investigating with, and this is interesting, the narrative gets into the head of the murderer and we read what he’s doing and thinking but *we don’t know who he is! * This is quite well done as well as being innovative. Points for this device. And then evidence of crimes far worse, more grizzly, definitely psychotic, than cutting off a leg show up in addition to the problem of molestation and abuse. Of course the on-going relationship of Robin and her long-term fiancé is in trouble as well as Strike’s relationship with his shorter-term girlfriend/partner. So why are an aging crippled detective and a young intelligent woman refusing to admit they are attracted to each other? – Read on – that story has been going on for 3 books now. I only read one of the Harry Potter books and enjoyed it well enough – had I been 10 years old I would have immediately become a rabid fan, but alas … That said, Rowling can certainly write a good adult crime novel. The Casual Vacancy (non-crime) was good, (I rated it an 8), but it was mostly just general fiction, a satire of contemporary socio-political life in Britain. I’ve enjoyed the Comoran Strike books quite a lot and I’ll be reading the next ones as they appear.